On May 23rd, 2003, Julia, passed away at Boston's Children's Hospital. Julia bravely fought every health obstacle put in her way. Julia battled autism, renal failure, and a seizure disorder just to name a few, and finally Julia succumbed to hemorrhagic pancreatitis after celebrating her 9th birthday in the ICU at Children's Hospital. It had been our home for the last 9 months of her life. Julia's medical issues never kept her down. At age 2 1/2 she developed a seizure disorder and had to be watched constantly, which included many trips to the hospital and many doctors appointments. 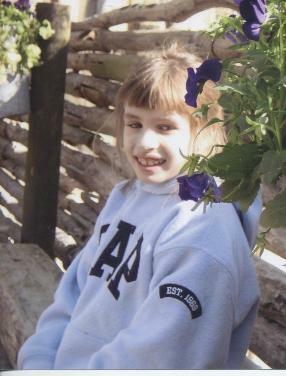 When Julia was preschool age, she was tested and found to be developmentally delayed and received the diagnosis of PDD-NOS: pervasively developmentally delayed – not otherwise specified. She began attending the early intervention program at the Early Learning Center and then The Community Elementary School in North Attleboro, Massachusetts. At age 6, Julia was diagnosed with the renal disease of focal segmented glomerular sclerosis and a few short months later her kidneys failed and she had to go on dialysis. Even dialysis didn't keep her from doing the things she loved. She vacationed with her family, played with her family and friends, and attended school with her friends. As far as she was concerned, she was no different from any one else. She just went to the doctors a little more often. 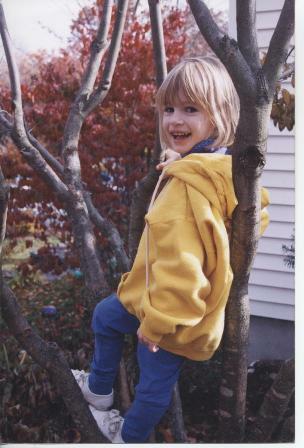 Just before Halloween 2002, we brought Julia to Boston's Children's Hospital because she was complaining of abdominal pain. She was diagnosed as having pancreatitis. We didn't know it at the time but this would be Julia’s home until she passed away in May of 2003. We never left her side. Julia’s life and death affected many people. Not just her family and friends, but also the health care professionals who cared for her in the hospital. Her life may have been short, but it was intensely inspirational for many. So, after much emotional consideration, The Julia Cekala Charitable Foundation was born. The foundation wasn't created with the focus of how Julia passed. It was created to celebrate the memory of how she lived. The goal of The Julia Cekala Foundation is to focus on the issues that affected Julia’s life and to support the community through recreation, education and medical assistance. Julia enjoyed living in North Attleboro and we have many friends and family here in town. She especially enjoyed playing at the World War I Memorial Park. She loved to climb on the rocks and visit the animals. Julia loved playing outside. She helped me plant my garden every year and she found joy in nature. We wanted to create a place for the community that would celebrate the magic of Julia. The World War I Park was the perfect location. Our parents took us to play there when we were children, and we, in turn, took our children. “Julia's Garden" is our first project. With the help of ICON Park Design, we designed a beautiful, whimsical garden that celebrates nature. We incorporated aspects of Julia in this park, focusing on the joys in her life. She loved playgrounds, autumn leaves, earthworms, flowers, unicorns and butterflies. At home, she loved her slide and her waterfall. Julia passionately loved music. It was music and bubbles that occupied her days in the hospital and gave her joy. You will find all of these elements at “Julia’s Garden”. With private funds, we first built “Julia’s Playground” and then broke ground for “Julia’s Garden”. In Spring 2007, we will officially celebrate the opening of the garden. The Foundation will begin fundraising in 2007 to continue to expansion and maintenance of the garden park. We will also be fundraising to bring education to the community about autism and kidney donation and transplantation. Julia was mildly autistic and her brother, Nick, who is also autistic and has all of the same medical issues, survives her. Nick now has a healthy kidney thanks to our loving friend, Ida Simpson. He has a second chance at life. Living Organ Donation will be a focus for the foundation. Since both Nick and Julia were autistic and both came along way emerging through autism with biomedical treatments, we intend on also focusing on these treatments directly through the foundation. Julia spent so much time in the hospital and our whole family had to make it our home away from home. The Julia Foundation will be directly providing ways to make long and short term stays more comfortable for patients and their families at both Massachusetts General Hospital and Children’s Hospital in Boston, Massachusetts. It is important to all who loved Julia that her life, although short, serve to better the lives of others. We can’t do all of this alone. It was the love and support of our family and friends that gave us strength and helped carry us through the difficult times of Julia’s life. We need your help. Join us in our community effort to reach out to help other children in need and help us nurture “Julia’s Garden” to blossom into a magical place so that people of all ages and abilities may find joy. We can together “plant and seed and make a garden grow”! Please click on the support link above to see how you can help. You can also join our email list below to keep up on upcoming events and garden activities.